You can find many people who are super star designers. However, can you find the combination of a designer that is not quite a superstar, but who is still pretty good, and understands finances? How about a designer who knows the basics of engineering? Even rarer. People want interesting. Many CEOs are renaissance people, knowing several fields, such as marketing and philosophy, or finance and physics. It’s what drove me to learn about user experience, marketing and now finances. This article is going to focus on finances, a topic I’ve always been interested in. You don’t have to become an expert in finances, but you should become more knowledgeable than the average person in something completely different from the primary field that you’re in. I first started dabbling on my own in investing stocks three years ago by using penny stocks. I figured I could throw a set amount of money towards this and see what happened. If it was a total loss, it’s not ideal, but I would learn a few things. I ended up losing most of it but I learned much in the process. In my trial and error stage, I invested in anything that seemed interesting. Most of the things that I invested in failed, such as protein bars for dogs. However, one of the stocks was an organic juice company that actually took off. I bought the shares around .29 a share and I sold it at .55 cents a share. That’s almost double the gain on that stock. Winning. I got more confident in my investing and decided to start throwing a set amount of money towards certain stocks. I used to be a huge video game fan, growing up playing Nintendo games such as Mario, Zelda and Final Fantasy. I invested in Nintendo right before the Pokemon Go fad took off last summer. I saw the stock rise into high $30s a share and thought “sweet, I’ve got this and just made a ton of cash.” However, the stock took a nosedive. Instead of holding in the long term, I got nervous and sold it at what I bought it at. What I learned from these experiences is that you have to be ok with risking losing it all. Tim Ferriss, master experimenter, touches on this in his book Tools of Titans. If you’re not ok with losing your money, then don’t invest the money. It’s the same as gambling. I’m not a day trader because I don’t have the time to micromanage my investing. So investing in the long term is the way to go. I’ve decided that if I buy any stock, I have to be ok with losing it all, having no control over the market. I’m ok with that now because I’ve set those rules up for myself. I audited a tax class this past fall taught by a friend of mine, who happens to be a professor, Kim Livensparger. He has over 30 years of experience in financing, accounting and taxes and is a CFO for a medium sized company. I work full time and I didn’t want to do the homework. So I just did the required readings, showed up to class to hear Kim share his knowledge and leave. The results surprised me. I learned exponentially much more from sitting in the class and reading the books about finances and investing than I had from hours spent online doing research, watching webinars and more. Am I an expert? No. But I now know more about how tax finances work for personal and businesses than most people. I now have the edge and I apply this to my human centered design solutions that I create. I have a basic knowledge and framework around finances that I now use on a daily basis. What a low cost investment for a huge return. What is Kim’s advice to us? 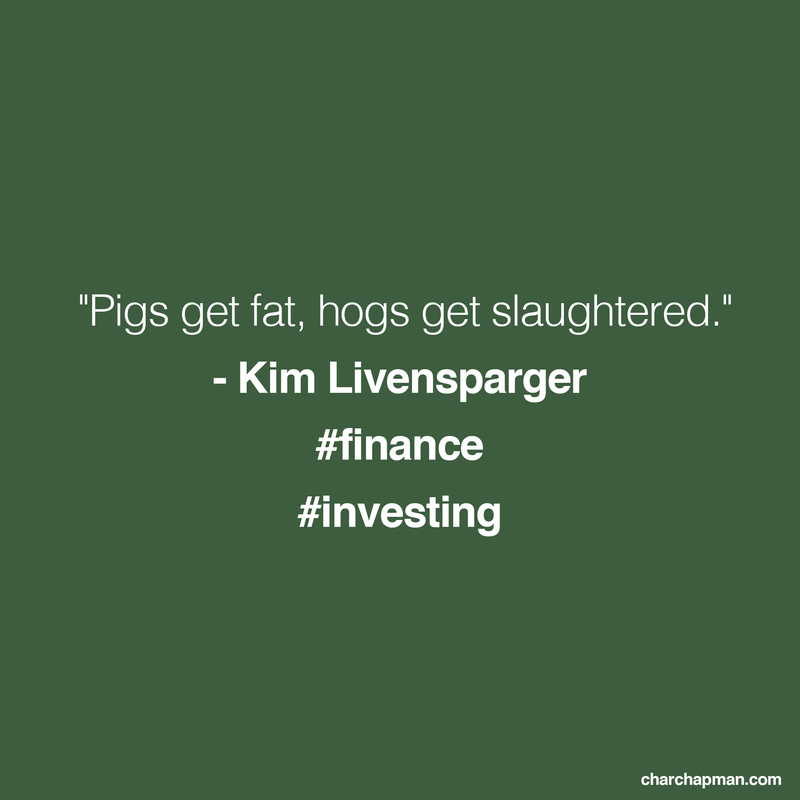 In his own words, “pigs get fat, hogs get slaughtered.” Sometimes when you invest stock, you stay in too long thinking your going to win big with making tons of money and instead you loose it all. What have you done to make yourself more interesting to potential employers? Did it work? Share in the comments below!